The Northern Cape, the astronomical capital of South Africa, is home to the South African Largest Telescope (SALT) and the Square Kilometre Array (SKA) project. These two projects are to help make our lives be more informed and advance Space Knowledge. Over the weekend of 22-24 April, Kimberley joined over 100 locations around the world for the NASA International Space Apps challenge. The Innovation Incubation programme by NASA seeks to gather developers/innovations together to solve challenges in space and impact of life on earth. First in the province, the Kimberley edition of Space Apps challenge was hosted at the Sol Plaatje University on the university's official opening weekend. Over 30 local developers came through to put their skills into test and motion for change. Six solutions were solved from the hackathon, watch what the teams were up to. Space Apps challenge in Kimberley was hosted by the Northern Cape DEDaT (Knowledge Economy & Innovation) and Geekulcha (GKSS). 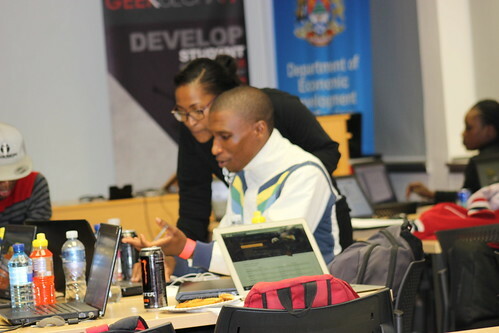 The hackathon was supported by SITA in the Northern Cape and the Diamond Creative Vision Hub. Space Heritage is certainly growing, it's always great seeing the community get together and work for change. The Chairperson of the Geekulcha Student Society, Ms Nomfundo Nkosi, thanked everyone who came through to the Space Apps Kimberley. "I'd like to take this opportunity to THANK EACH AND EVERY INDIVIDUAL who sacrificed their weekend to attend the SpaceApps Hackathon. Most importantly I hope everyone learnt something and had lots of Fun." Geekulcha extends a thank you to all the partners/sponsors who helped make this event a success.